The National Eye Institute of the National Institutes of Health this month awarded Wayne State University School of Medicine a new five-year, $2,212,710 R01 grant to explore treatment options for herpes stromal keratitis, the most common cause of infection-induced blindness in the United States. 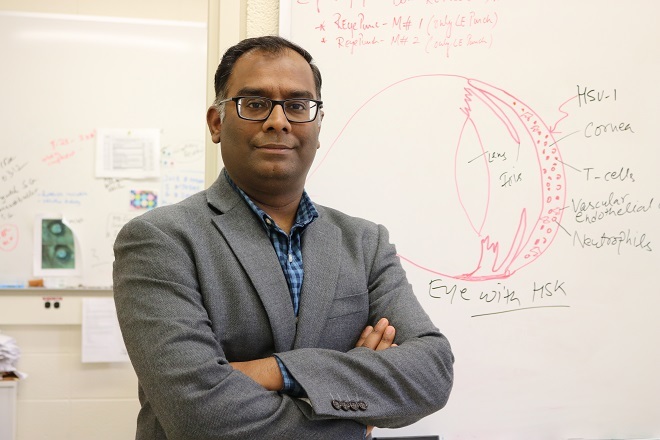 Postdoctoral fellow Pushpa Rao, Ph.D., and principal investigator Susmit Suvas, Ph.D.
HSK is a chronic eye inflammation that develops from recurrent herpes simplex virus-1 infections in the cornea. With it, the cornea loses its clarity, and leaky blood vessels form, leading to an inflamed cornea. Repeated episodes of HSK can cause blindness. Long-term use of corticosteroids has significant side effects, though, including glaucoma, cataract and susceptibility to other infections. “We anticipate that successful completion of our study will provide novel therapeutic targets to develop the drugs to resolve HSK lesions,” he said. The challenge is that a large number of immune cells such as neutrophils and T cells found in HSV-1 infected corneas play a significant role in the development of HSK lesions. Preliminary results published in the January 2019 issue of The Journal of Immunology showed the development of hypoxia and the expression of hypoxia-associated genes in HSK lesions. Associate Professor Susmit Suvas, Ph.D.
“In the first year of our funding, we will address how neutrophils cause hypoxia in HSK lesions. This will be carried out by blocking the expression of the genes, which help neutrophils to consume the oxygen. We expect that our approach will reduce the development of inflammatory hypoxia and hypoxia associated genes in HSV-1 infected cornea and thereby improve the severity of HSK lesions,” he said. Dr. Suvas directs the Anatomy and Cell Biology doctoral program at the school. He joined Wayne State University in 2014 because of Wayne’s strong vision science group, he said, bringing his first R01 with him. 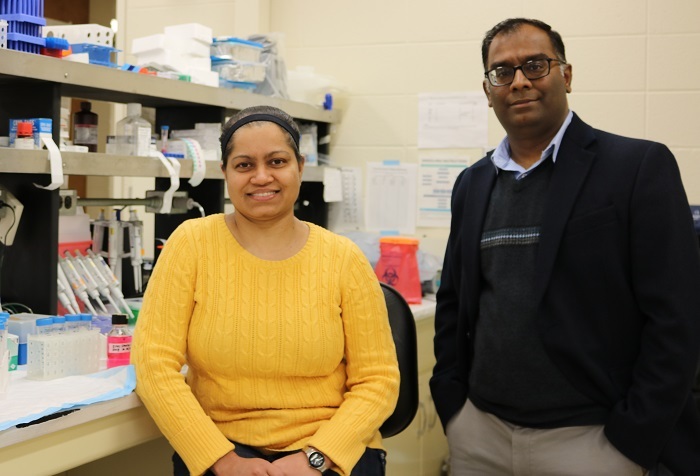 His WSU team includes Pushpa Rao, Ph.D., his mentee from 2014-2019 who graduated with her doctoral degree earlier this month. Dr. Rao generated the data for the NIH application, along with former graduate student Andrew Jerome, Ph.D., and former postdoctoral fellow Subhash Gaddipati. Dr. Suvas is looking for new graduate students and postdoctoral researchers to perform the new studies. For more information, email ssuvas@med.wayne.edu. The grant number for this National Eye Institute of the National Institutes of Health is 1R01EY029690.